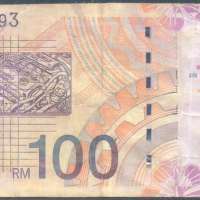 This is a forgery RM100 Malaysia banknote. Acquired from a friend who was managing a petrol pump station in Penang. His cashier was paid by a motorcyclist who want to fuel his motorcycle by using this note for only RM5 and returning RM95 in original notes. The front silver strip was taken from original RM10 note, but extended another 4mm with blank silver sticker at the bottom. Two zeroes on the top-right were re-embossed using marker. On the reverse, 6 silver lines were glued to act like original security thread, but closer looks reveals non-straight line. The printing appears to be fade, probably printed using jet-ink printer, poor quality type of paper. The shade of Agong was meant to as watermark, but printed in shady. Acquired for the price of RM50. Front: Tuanku Abdul Rahman wearing tengkolok headgear. Back: Manufacturing sector, car production line; Proton car engine; gear wheen and cam-patterns. LEAD holographic stripe. Windowed security thread with demetalized. Printed by Giesecke & Devrient.